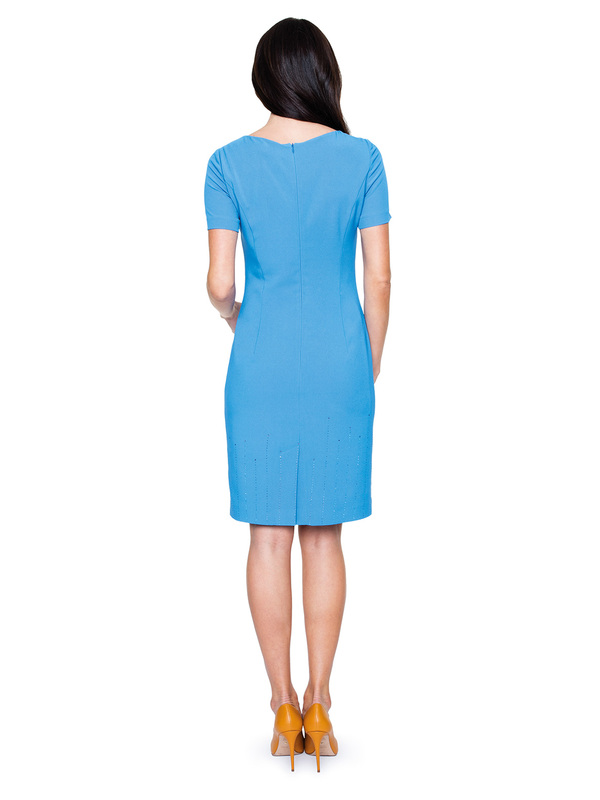 Elegant, minimalist dress in a beautiful, hypnotizing colour. For office meetings and original occasions. The simplicity of the Kiran model captivates and creates a field for fashion shows. The dress has a delicate, rounded neckline. Its colour is intense blue. Kiran has short sleeves and length in front of the knees. Slim figure optically by means of vertical stitching. Decorative accent are shiny applications crowning the bottom of the dress. To bring out the depths of elegance, choose a mustard shuttle and a silver clutch bag for your dress. You can also combine it with more classic accessories, such as a black handbag on a chain and high-heeled shoes of the same colour.